The Joomla! World Conference 2014 is here, and SIMBunch is proud to promote the event. From now until November 1st, simply use the coupon code SIMBUNCH and enjoy a $150 discount. That's a 50% off for the standard ticket! Hurry and secure your ticket now . So it's that time of the year again. To celebrate the holidays, we at SIMBunch is throwing a 30% discount for all our products. From now until 31st December, simply use the coupon code SIMXMAS during checkout to enjoy your holiday savings! 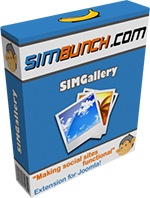 SIMGallery 4.2 has just been released with 2 new featues: It is now completely integrated with EasySocial (full details of the integration can be found in the product description), and albums commenting has been added. Give the demo a try! We have added EasySocial to the list of SIMAnswers's integrations. This includes integrating with EasySocial's notifications, activities stream, user profiles, and points system. 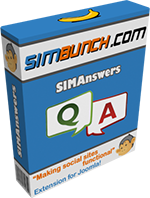 The SIMAnswers package also comes with an EasySocial app that displays your users' Q&A summary. We'll be adding EasySocial to our demo site soon, so stay tuned! For a full list of integrations and detailed description, please check out the documentation - or dive straight into the demo!